(PhD York University) Human perception of motion and depth. Psychophysical and computational methods to study depth perception in natural and virtual environments. Applications to the design of the human-computer interface for virtual reality and simulator systems. Other interests include computer vision; the measurement and analysis of eye movements and related applications; and the measurement and perception of human motion. website My primary research interests deal with the auditory system, chiefly in the context of how sound is transduced by the ear into neural impulses going to the brain. Remarkably, somehow in the process of being a very sensitive detector, the (healthy) ear generates and subsequently emits sounds that can be detected non-invasively using a sensitive microphone. These sounds, known as otoacoustic emissions (OAEs), reveal many aspects of the inner workings of the ear and also have many translational applications (e.g., clinical audiology). Our lab combines both experimental (acoustic and neurophysiological) and theoretical/modeling approaches across a broad comparative framework (humans, birds, lizards) so to help us better understand OAEs and thereby the key biophysical processes at work that allow us to hear the world around us. e-mail Systems, cognitive, and computational neuroscience; visual-motor transformations. Neural mechanisms and computational principles used by the brain to perceive 3-D space and generate accurate 3-D orienting movements. Visual consequences and control of eye movements, eye, and head gaze shifts, and visually guided arm movements. website Visual perception and attention laboratory. Systems and cognitive neuroscience approach to understanding attentional mechanisms, feature binding, and object processing. (PhD Cambridge University) The Harrislab multisensory integration laboratory explores the ways in which we combine information from different senses. How do hearing, vision, touch, and sensory information about body movement and position combine to tell us where and when events happen and what the body’s current position and orientation is? Techniques include eye and head tracking, psychophysics and virtual reality. website Sensorimotor control and learning; eye, head, limb movements and coordination; vision, haptics, kinesthesia; sensorimotor integration. (PhD University of Alberta) Comparative cognition, including learning and memory processes in primate species. (PhD Carleton University) Cognitive neuroscience. Investigating attention and memory (facilitation and/or attenuation) by exploring the neural underpinnings of function through computerized testing procedures or brain imaging in the young, healthy aging population or in those patients at the very early stages of dementia. website Space perception, binocular vision, eye movement. website Cognitive development; Developmental cognitive neuroscience; Learning and memory development; Memory for time and space; Episodic memory, autobiographical memory, and semantic memory; Brain development; Learning in naturalistic settings including science centres and museums. Methods: Behavioural assessments, eye tracking, ERP and neuroimaging. website Human brain research. Visual psychophysics: spatial form vision, figure-ground, depth vision, motion, colour, spatial discriminations. Auditory psychophysics: AM and FM channels, auditory localization, speech perception. Human evoked potentials and magnetic brain responses (sensory), visual and auditory. Somatosensation. Application of visual and auditory psychophysics and brain recording to medicine (multiple sclerosis, Parkinson’s disease, glaucoma, amblyopia). Vision in aviation and driving. Eye movements. (PhD Harvard University) Visual perception; shape perception in brain damaged individuals and normals. How different visual attributes such as colour, luminance, texture and motion are integrated together to provide visual analyses. website Human ethology and evolutionary psychology. website Scene and face processing, psychophysics and neuroimaging in neurological patients and healthy controls. website Dr. Troje's research is focused on questions concerning the nature of sensorimotor representations. How can a stream of noisy nerve cell excitations possibly be turned into the coherent and predictable perception of “reality”? Researchers and students in the BioMotion Lab work on questions involving the processing of sensory information, perception, cognition, sensorimotor control and communication. website The analyses of sociobiological theories as applied to within and between human group differences. website Fundamental and applied aspects of stereoscopic (3D) depth perception with a focus on how stereopsis is used in the ‘real world’; understanding how the brain achieves such an exquisite depth percept from such complex information; modelling how it is then capable of reconstructing depth in impoverished stimuli. website Visual perception with particular emphasis on face and shape recognition. Involvement of the visual system in migraine. (Professor Emeritus) Psychophysics of form vision and motion perception, face perception, neural modeling of cortical visual function, FMRI brain imaging of human visual cortical areas, nonlinear dynamics. website Developmental Science Infants’ visual, attentional and memory development from a neuroscience perspective. Specific topics include the relation between cognitive processes and young infants’ formation of future-oriented expectations for the spatial, temporal, and content information of visual events; the interface between visual expectations and memory processes; development of mechanisms for selective attention and visual search; development of object recognition; and the processes involved in infants’ control and execution of eye movements. Developmental Science Cognitive and attention skills in children with autism, developmental disabilities, and children who are deaf. Roles of metacognition (awareness of self) and language proficiency (e.g., English or signed systems) in the cognitive development of these groups. Early identification; assessment methods; intervention effectiveness. website Developmental Science Cognitive development and literacy acquisition in monolingual and bilingual children, development of executive processes across the lifespan, and effect of bilingualism on cognitive aging. Methods include studying participants of all ages (4-80 years) using behavioural and imaging techniques. (PhD York University) Social and Personality Aetiological factors in the development of eating disorders, compulsive overeating, and obesity. Issues related to the biological basis of personality and how this relates to disordered eating, and other addictive behaviours, are also considered. website Clinical Explores how the emotional state of an observer, and also the emotional significance of environmental information, influences the deployment of attention. Exploring the experience of boredom, and individual differences that impact on susceptibility to boredom. Focused on gaining a better understanding of basic psychological processes, as well as, examining issues that relate more specifically to clinical psychology. website Developmental Science Cognitive science and cognitive neuroscience. Understanding the cognitive and neurophysiological structures and processes underlying human reasoning and problem-solving abilities. Verbal protocol analysis studies of normal and patient populations, computational modelling, and neuroimaging techniques involving Positron Emission Tomography (PET) and Functional Magnetic Resonance Imaging (FMRI). Bridging the “gap” between cognitive and neurophysiological vocabularies. website Historical, Theoretical and Critical Studies of Psychology History of American experimental psychology (ca. 1880-1930). Ada Lovelace, Charles Babbage, and his Analytical Engine. Research methods and statistics. Development and delivery of electronic research and educational materials (websites, digital video, podcasts, etc.). website Developmental Science Cognitive development, individual differences, and cognitive process analysis. Culture-fair assessment of cognitive capacity in mainstream and special developmental samples (e.g., deaf, gifted, ESL, language delayed); children’s intuitive reasoning in mathematics; measurement of executive functions in children and adults; cognitive style and language processing; cognitive-developmental factors in metaphor comprehension; mental arousal/motivation as factors in cognitive performance. website Social and Personality Projection of the self into fictional narratives. The ascription of intentionality to abstract social agents. Individual differences in, and the core processes of, empathy and social understanding. Imagination. Stimulation based theories of language comprehension. And the neural underpinnings of these processes. e-mail Clinical Developmental Psychology FASD and the criminal justice system; forensic psychology. e-mail Brain, Behaviour and Cognitive Science Investigates the cognitive and neuropsychological processes associated with perceiving, remembering, and performing goal-directed naturalistic actions. Has a particular interest in the roles of attention and memory. Based on this understanding develops and evaluates methods of neuropsychological rehabilitation of brain-injured individuals. e-mail Developmental Science Cognitive development and neuropsychology. Mental attention, working memory, executive functions, intelligence, representation, problem-solving, learning, and their organismic processes. Methods of task analysis. Epistemology/metatheories of human science. Neo-Piagetian research on childhood, infancy, adulthood, and aging. website Clinical Primary research focus is on different aspects of memory processing (e.g., semantic memory, implicit memory, source memory, prospective memory) and cognition in healthy young individuals, normal aging, and mild cognitive impairment (a transitional stage between healthy aging and dementia). Her clinical work involves neuropsychological assessment, particularly for differential diagnosis of dementia in geriatric populations. website Clinical Studies the organization of different types of memory in the brain using cognitive, neuropsychological, and functional neuroimaging methods. Patient and fMRI studies of recent and remote memory; hippocampal and cortical contributions to episodic, semantic, and spatial memory; representation of theory of mind and the self in prefrontal and temporoparietal cortex. e-mail Social and Personality How psychologists conceptualize and research lesbian, gay, bisexual and transgender experience. Stereotypes of sexual assault and childhood sexual abuse survivors. e-mail Developmental Science Comparative/evolutionary studies of nonhuman primates, especially the great apes (orangutans, chimpanzees) and especially cognitive development. Imitation and other forms of social learning, tool use, ecological problem solving (arboreal and foraging problems), and the evolution of primate and great ape intelligence. Study of various facets of orangutan intelligence and cognitive ecology in free-ranging ex-captive orangutans in Indonesian Borneo. e-mail Developmental Science My primary research interests are in the areas of cognitive neuroscience, functional neuroimaging (MRI), and neurocognitive development and aging. My program of research broadly investigates the neurocognitive specialization, organization, and interaction of brain systems that underlie human conceptual processing, and the related processes of memory and perceptual abstraction. I use a combination of behavioral, neuropsychological, neuroimaging, and neurostimulation methodologies (e.g., MRI, TMS) to elucidate how cognitive abstraction underlies our ability to grasp, retain, and retrieve information in the form of conceptual knowledge. I also investigate how these processes are affected by healthy aging, and by developmental and neurological disorders. website Development of a narrative process model and research measure that addresses the contributions of narrative and emotion processes to effective psychotherapy. The role of autobiographical memory narratives to the etiology and treatment of depression. e-mail Explores how the emotional state of an observer, and also the emotional significance of environmental information, influences the deployment of attention. Exploring the experience of boredom, and individual differences that impact on susceptibility to boredom. Focused on gaining a better understanding of basic psychological processes, as well as examining issues that relate more specifically to clinical psychology. website Research focuses on the coping and adaptation processes of individuals affected by life-threatening illness in general, and cancer specifically. A strong interest in intimate relationships and how couples adjust to illness, adversity, and loss. Employ qualitative methods in order to derive in-depth understanding of these experiences. These findings in turn inform the development of psychotherapeutic and psychoeducational interventions (individual, couple, group, and internet-based) intended to reduce distress and suffering associated with illness. website CBT for psychosis, EEG correlates of shyness and emotion perception in schizophrenia, smoking management and healthy lifestyles in schizophrenia, functional outcomes and 'recovery' in schizophrenia, development of a 'voices' questionnaire. Clinical assessment using personality and neuropsychological methods. website Psychotherapy process and outcome research with a particular focus on identifying processes of change and relating these to outcome. Empirically supporting experiential therapy with a special focus on the treatment of depression. The role of emotion in therapy and constructivism in the generation of meaning. The development of the principles of a dialectical-constructivist emotion-focused therapy for individuals and couples. Psychotherapy integration. website Clinical research focused on neuropsychological performance and functional outcome in schizophrenia. Interested in the use of neurocognitive data to enhance diagnostic validity, rehabilitation and the search for endophenotypes for the illness. Also has broader theoretical and historical interests in schizophrenia. website The study of the bio–behavioural mechanisms underlying the effects of negative emotions on the cardiovascular system with a specific focus on myocardial ischemia and cardiac arrhythmias. Cognitive-behaviour therapy for promoting health behaviour change (e.g., smoking sensation) and adaptation to illness (e.g., treatment of depression following an acute coronary event) Enhancing adherence to health behaviour change (e.g., smoking cessation, diet, exercise and medication adherence). e-mail Psychological, emotional, and biomedical factors involved in acute and chronic pain with a particular emphasis on (1) understanding the psychological and physiological processes and mechanisms involved in the transition of acute, time-limited pain to chronic, pathological pain; (2) identifying factors involved in the establishment and reactivation of pain memories after amputation (phantom limb pain) and other traumatic events; (3) pre-emptive analgesia and other preventive pharmacological interventions designed to minimize acute post-operative pain and to elucidate the mechanisms involved in post-operative sensitization; (4) developing pharmacological and nonpharmacological interventions to minimize pain and stress in hospitalized infants; and (5) gender differences in acute post-operative pain and analgesic consumption. website Broad area of eating and its disorders from both a social/personality and a clinical psychology perspective. Factors that influence women to undertake or continue dieting, and psychological consequences of restrictive eating. Effects of exposure to thin media images on eating, mood and body image among female dieters and nondieters. Anxiety, perfectionism, possible selves, body image and social influences on eating. website Vulnerability to depression including the personality styles of dependency and self-criticism, and associated interpersonal behaviours. Transactional models of depression including the dynamics between vulnerable individuals and their social context. Resilience building in those vulnerable to depression is also a current focus. e-mail Investigates the cognitive and neuropsychological processes associated with perceiving, remembering, and performing goal-directed naturalistic actions. Has a particular interest in the roles of attention and memory. Based on this understanding develops and evaluates methods of neuropsychological rehabilitation of brain-injured individuals. e-mail Present research interests concern psychotherapy processes, emotional processing and the working alliance in particular, and the role they play in change during experiential treatment of depression. I am also exploring prototypical paths of emotional change that mark resolution of subtypes of depression, which would allow for more differential treatment of the disorder. A core interest in emotion processes in general, including nonverbal expressions of emotion, emotion regulation, interruption of emotional experience, and emotion typology. Other research interests are in the identification the client characteristics that reliably predict differential response to experiential psychotherapy. e-mail Relationship Science: the integration of intrapsychic (cognitive) and interpersonal processes and how this natural integration can be used to facilitate therapeutic change. Applying complex systems theory to understand the functioning of individuals within relationships such as marriage/committed relationships, organizations and family. The role of psychology in understanding health issues. website Primary research focus is on different aspects of memory processing (e.g., semantic memory, implicit memory, source memory, prospective memory) and cognition in healthy young individuals, normal aging, and mild cognitive impairment (a transitional stage between healthy aging and dementia). Her clinical work involves neuropsychological assessment, particularly for differential diagnosis of dementia in geriatric populations. website Studies the organization of different types of memory in the brain using cognitive, neuropsychological, and functional neuroimaging methods. Patient and fMRI studies of recent and remote memory; hippocampal and cortical contributions to episodic, semantic, and spatial memory; representation of theory of mind and the self in prefrontal and temporoparietal cortex. e-mail Analysis and evaluation of psychotherapy process; the differential effect of counsellor style of participation on client levels of perceptual processing; process evaluations of self-schema change; the role of culture in psychotherapy. e-mail Application of structural models of personality (i.e., interpersonal circumplex and five-factor models of personality) to increasing understanding of mental, physical, and neuropsychological health processes and outcomes. How personality variables affect the physical and psychological problems to which one is most prone, how one copes with these problems, and how these variables affect outcomes. The role of social support processes and how these variables affect relationship satisfaction and the ability to establish and maintain satisfying relationships. e-mail Neural correlates of higher cognitive (i.e. executive control) functions in normal ageing, brain injury and disease using neuroimaging methods; Neurorehabilitation interventions to enhance cognitive functioning in normal ageing and neurological populations; Integration of brain and behavioural measures in neuropsychological assessment. website Individual and contextual determinants of engagement and disengagement in psychotherapy. Motivation for change and Motivational Interviewing as an adjunct to Cognitive Behavioural Therapy (CBT) or integrated with CBT in the management of anxiety disorders. How expectancies influence psychotherapy processes & outcomes. Relational predictors of help-seeking and detection of mood and anxiety disorders in primary care. (PhD McMaster University) Social and Personality Credulity, superstition, and belief systems. Developmental Science Cognitive and attention skills in children with autism, developmental disabilities and children who are deaf. Roles of metacognition (awareness of self) and language proficiency (e.g., English or signed systems) in the cognitive development of these groups. Early identification; assessment methods; intervention effectiveness. Developmental Science The Teen Relationships Lab studies adolescents’ social development and psycho-social health. Dating and romantic relationships are the main focus right now. I am interested in normal development, atypical development and high-risk contexts. Current projects examine healthy relationships and resilience, conflict, break-ups, dating violence, teen mothers, and relationships of vulnerable youth. e-mail Historical, Theoretical and Critical Studies of Psychology History of psychology and psychoanalysis; scientific biography; history and theory of intelligence testing. e-mail Social and Personality The roles of trait perfectionism and perfectionistic self-presentation in personal adjustment, psychosocial functioning, and health problems. The associations among personality, coping, stress, and distress in adolescents, middleaged individuals, and the elderly. (PhD McGill University) The study of pain across the adult life span. Age differences in the mechanisms, assessment and treatment of postoperative and cancer pain and the role of psychosocial factors, such as distress, gender and cognitive impairment, in pain. website Social and Personality Social psychology of intergroup relations with a focus on issues of ethnic, cultural, and national identity. Responses to discrimination, immigrant acculturation, and bicultural identification. website Social and Personality Social information processing and socialcognitive models. Aspects of the self, depression, and interpersonal communication. website Clinical Child and adult survivors of abuse; effective models for the treatment of psychological trauma; understanding child and adult attachments to help guide appropriate interventions; the role of social support in recovery from abuse. e-mail Social and Personality The impact of a chilly climate on womens experience of graduate education; mentoring; history of the influence of feminism on Canadian psychology; violence against women, feminist methodology. website Brain, Behaviour and Cognitive Science Human brain research. Visual psychophysics: spatial form vision, figure-ground, depth vision, motion, colour, spatial discriminations. Auditory psychophysics: AM and FM channels, auditory localization, speech perception. Human evoked potentials and magnetic brain responses (sensory), visual and auditory. Somatosensation. Application of visual and auditory psychophysics and brain recording to medicine (multiple sclerosis, Parkinsons disease, glaucoma, amblyopia). Vision in aviation and driving. Eye movements. (PhD California School of Professional Psychology) Cognitive behavioural therapy for chronic illness (particularly cancer) delivered via innovative methods (telephone counseling, manuals, website interaction); AIDS prevention in African youth (Uganda, Kenya); preventive oncology (cancer screening, dietary modification, exercise promotion); cross–cultural communication; vaccine delivery, acceptance, development; valuebased purchasing and incentive systems for physician performance. website Historical, Theoretical and Critical Studies of Psychology Feminist epistemology and historiography; history of women in psychology; diversity issues in psychology; history of behavioral psychology; B. F. Skinner's system in science and culture; history of clinical psychology and psychological practices; oral history methods; critical and cultural history. website Brain, Behaviour and Cognitive Science Human ethology and evolutionary psychology. website Historical, Theoretical and Critical Studies of Psychology History of child development and psychology, including the influence of eugenics and ideas of race. Normal and atypical development and the influence of evolutionary theory and biology on psychological models of development. Personality theory and its history. The conceptual and historical basis of classification and classificatory systems. Developmental Science Social and emotional development in ages ranging from preschoolers to adults. Social development in the areas of advice-seeking and consultant preferences, social support provision, and social relations with parents and peers. New scales tapping perceptions of reciprocity in relations with parents, spouses and coworkers are being examined for their clinical relevance. Emotional development in the relationship between emotion, cognition and emotion regulation. e-mail Cognitive and attention skills in children with autism, developmental disabilities and children who are deaf. Roles of metacognition (awareness of self) and language proficiency (e.g., English or signed systems) in the cognitive development of these groups. Early identification; assessment methods; intervention effectiveness. website Infants, children and families at risk. Cognitively based interventions at the interface between attachment and parental attributions. Cross-cultural parenting. Cognitivebehavioural interventions for children. Children with special needs. website Peer and romantic relationships in adolescence. Romance and sexuality in early adolescence; intimacy and autonomy development in adolescence romantic relationships; dating violence; school-based prevention of dating violence; peer and media influences on dating violence. e-mail Neuropsychology. Cognitive, behavioural, and emotional functioning of children with diabetes and epilepsy. Spatial and working memory. Fetal alcohol spectrum disorders and congenital hypothyroidism. website Forensic Psychology, especially issues pertaining to child witnesses, memory, language comprehension, suggestibility, police investigative practices, and interrogations. website Child and adult survivors of abuse; effective models for the treatment of psychological trauma; understanding child and adult attachments to help guide appropriate interventions; the role of social support in recovery from abuse. e-mail Children in families at risk; peer relations of aggressive children; bullying and victimization in childhood and adolescence; girls' aggression; prevention and intervention. e-mail Assessment/diagnosis of autism and developmental disabilities, evaluation of the effectiveness of interventions (including especially intensive behavioural intervention), and the positive and negative impacts on families in terms of stress and coping (parents and siblings). website Understanding how young child and parents interact in painful situations; infant and preschool negative affect regulation, academic performance and social-emotional well-being. e-mail Broadly adolescent health promotion and risk reduction; major depression in adolescents; emergence of seasonal depression in adolescents, cognitive vulnerability to depression, relationship between mood and risk behaviours, developing and evaluating strength-based prevention programs for Aboriginal youth. website Clinical neuropsychology, impact of neurodegenerative disease on neuropsychologic function (multiple sclerosis, Huntington disease), children's environmental health (impact of early exposure to chemicals on child development), and cognitive rehabilitation. website Assessment, diagnosis and treatment of attention and learning disorders in children and adolescents; understanding how cognitive and affective processes develop in clinical and healthy populations; dual process models of human reasoning in clinical and healthy populations. website Prevention and treatment of mental health problems in people with autism spectrum disorders and/or intellectual disabilities across the lifespan. Experience of family caregivers. Mental health services for people with developmental disabilities. Program development and evaluation, the impact of Special Olympics on the psychological well-being of participants, and of cognitive-behavioural and social skill interventions. Profile Social & emotional development, including gender differences & immigrant/generational status. Currently investigating transitions of emerging adults (e.g. transition to university, domestic and international students, the army, etc). Also interested in developmental changes (from preschoolers to young adults) in social relations, consultant choices, social support, social participation skills & emotion cognition. e-mailwebsite The overall objective of my research program is to improve our understanding of cognitive dysfunction, psychological functioning, as well as mechanisms of compensation and recovery, in patients suffering from neurological disorders. My current research efforts are focused on mild traumatic brain injury and sport-related concussion in civilians, service members and veterans, as well as student and professional athletes. I am pursuing projects focused on 1) understanding how pre-morbid factors influence concussion risk and recovery, and (2) examining potential long-term consequences of multiple concussions and exposure to repetitive head trauma over the lifespan. website Clinical Explores how the emotional state of an observer, and also the emotional significance of environmental information, influences the deployment of attention. Exploring the experience of boredom, and individual differences that impact on susceptibility to boredom. Focused on gaining a better understanding of basic psychological processes, as well as examining issues that relate more specifically to clinical psychology. e-mail Clinical Psychological, emotional, and biomedical factors involved in acute and chronic pain with a particular emphasis on (1) understanding the psychological and physiological processes and mechanisms involved in the transition of acute, time-limited pain to chronic, pathological pain; (2) identifying factors involved in the establishment and reactivation of pain memories after amputation (phantom limb pain) and other traumatic events; (3) pre-emptive analgesia and other preventive pharmacological interventions designed to minimize acute post-operative pain and to elucidate the mechanisms involved in post-operative sensitization; (4) developing pharmacological and nonpharmacological interventions to minimize pain and stress in hospitalized infants; and (5) gender differences in acute post-operative pain and analgesic consumption. website Brain, Behaviour and Cognitive Science Human brain research. Visual psychophysics: spatial form vision, figure-ground, depth vision, motion, colour, spatial discriminations. Auditory psychophysics: AM and FM channels, auditory localization, speech perception. Human evoked potentials and magnetic brain responses (sensory), visual and auditory. Somatosensation. Application of visual and auditory psychophysics and brain recording to medicine (multiple sclerosis, Parkinson's disease, glaucoma, amblyopia). Vision in aviation and driving. Eye movements. (PhD Montreal) Developmental Science Lifespan developmental theory, including cognitive-affective stages. Pain, posttraumatic stress disorder, and traumatic brain injury - causality considerations. The development of manual lateralization/hemispheric specialization. website Infants' visual, attentional and memory development from a neuroscience perspective. Specific topics include the relation between cognitive processes and young infants' formation of future-oriented expectations for the spatial, temporal, and content information of visual events; the interface between visual expectations and memory processes; development of mechanisms for selective attention and visual search; development of object recognition; and the processes involved in infants' control and execution of eye movements. website Cognitive development and literacy acquisition in monolingual and bilingual children, development of executive processes across the lifespan, and effect of bilingualism on cognitive aging. Methods include studying participants of all ages (4-80 years) using behavioural and imaging techniques. website Cognitive science and cognitive neuroscience. Understanding the cognitive and neurophysiological structures and processes underlying human reasoning and problem solving abilities. Verbal protocol analysis studies of normal and patient populations, computational modelling, and neuroimaging techniques involving Positron Emission Tomography (PET) and Functional Magnetic Resonance Imaging (FMRI). Bridging the "gap" between cognitive and neurophysiological vocabularies. website Cognitive development, individual differences, and cognitive process analysis. Culture-fair assessment of cognitive capacity in mainstream and special developmental samples (e.g., deaf, gifted, ESL, language delayed); children's intuitive reasoning in mathematics; measurement of executive functions in children and adults; cognitive style and language processing; cognitive developmental factors in metaphor comprehension; mental arousal/motivation as factors in cognitive performance. e-mail Cognitive development and neuropsychology. Mental attention, working memory, executive functions, intelligence, representation, problem-solving, learning, and their organismic processes. Methods of task analysis. Epistemology/metatheories of human science. Neo-Piagetian research on childhood, infancy, adulthood and aging. (PhD University of Montreal) Comparative/evolutionary studies of nonhuman primates, especially the great apes (orangutans, chimpanzees) and especially cognitive development. Imitation and other forms of social learning, tool use, ecological problem solving (arboreal and foraging problems), and the evolution of primate and great ape intelligence. Study of various facets of orangutan intelligence and cognitive ecology in free-ranging ex-captive orangutans in Indonesian Borneo. e-mail My primary research interests are in the areas of cognitive neuroscience, functional neuroimaging (MRI), and neurocognitive development and aging. My program of research broadly investigates the neurocognitive specialization, organization, and interaction of brain systems that underlie human conceptual processing, and the related processes of memory and perceptual abstraction. I use a combination of behavioral, neuropsychological, neuroimaging, and neurostimulation methodologies (e.g., MRI, TMS) to elucidate how cognitive abstraction underlies our ability to grasp, retain, and retrieve information in the form of conceptual knowledge. I also investigate how these processes are affected by healthy aging, and by developmental and neurological disorders. website Life–span developmental changes in factors that underlie cognitive flexibility. Working memory, inhibition, and processing speed. Neural and behavioural measures of executive control and error processing. Using cognitive psychology to optimize learning and retention of educational materials. Distributed practice, testing and feedback effects. (PhD University of Montreal) Lifespan developmental theory, including cognitive–affective stages. Pain, posttraumatic stress disorder, and traumatic brain injury — causality considerations. The development of manual lateralization/hemispheric specialization. Developmental Science Neuropsychology. Cognitive, behavioural, and emotional functioning of children with diabetes and epilepsy. Spatial and working memory. Fetal alcohol spectrum disorders and congenital hypothyroidism. e-mail Social and Personality The roles of trait perfectionism and perfectionistic self-presentation in personal adjustment, psychosocial functioning, and health problems. The associations among personality, coping, stress, and distress in adolescents, middle-aged individuals, and the elderly. website Brain, Behaviour and Cognitive Science The development of methods for statistical graphics and data analysis, with particular emphasis on graphical methods for categorical data. History of data visualization. Exploratory data analysis, interactive computing, and psychological scaling. (PhD University of Cambridge) Brain, Behaviour and Cognitive Science The Harrislab multisensory integration laboratory explores the ways in which we combine information from different senses. How do hearing, vision, touch, and sensory information about body movement and position combine to tell us where and when events happen and what the body's current position and orientation is? Techniques include eye and head tracking, psychophysics and virtual reality. (PhD Carleton University) Brain, Behaviour and Cognitive Science Cognitive neuroscience. Investigating attention and memory (facilitation and/or attenuation) by exploring the neural underpinnings of function through computerized testing procedures or brain imaging in the young, healthy aging population or in those patients at the very early stages of dementia. Developmental Science Children in families at risk; peer relations of aggressive children; bullying and victimization in childhood and adolescence; girls' aggression; prevention and intervention. Developmental Science Exploring the conceptualization of chronic pain in hospitalized infants; understanding how parenting of infants impact health outcomes such as acute pain response; Pediatric psychology. e-mail Social and Personality Stereotyping, prejudice, and discrimination from the target’s perspective. How people combat the effects of negative self-relevant stereotypes in academic settings. How stereotypes are activated and inhibited in impression formation. The development of gender/ racial stereotypes and beliefs in children, examined from a social cognitive perspective. website Historical, Theoretical and Critical Studies of Psychology Critical reflection on the ontology, epistemology, and ethics of psychology from a historical and theoretical point of view. Studies on the history and theory of 19th century German philosophical psychology, the concept of race and racism, critical and postcolonial psychology. Interested in the history of developmental and social theory. Developmental Science Assessment, diagnosis and treatment of attention and learning disorders in children and adolescents; understanding how cognitive and affective processes develo in clinical and healthy populations; dual process models of human reasoning in clinical and healthy populations. website Brain, Behaviour and Cognitive Science Visual perception with particular emphasis on face and shape recognition. Involvement of the visual system in migraine. e-mail Historical epistemology of the human sciences; 19th & 20th century comparative, applied, and popular psychology; sociology of experimental systems; history of sexuality and racial formations; biopolitics; American cultural history; historiography. website Feminist epistemology and historiography; history of women in psychology; diversity issues in psychology; history of behavioral psychology; B. F. Skinner's system in science and culture; history of clinical psychology and psychological practices; oral history methods; critical and cultural history. website Critical reflection on the ontology, epistemology, and ethics of psychology from a historical and theoretical point of view. Studies on the history and theory of 19th-century German philosophical psychology, the concept of race and racism, critical and postcolonial psychology. Interested in the history of developmental and social theory. e-mail History of psychology and psychoanalysis; scientific biography; history and theory of intelligence testing. website History of child development and psychology, including the influence of eugenics and ideas of race. Normal and atypical development and the influence of evolutionary theory and biology on psychological models of development. Personality theory and its history. The conceptual and historical basis of classification and classificatory systems. website Clinical Clinical research focused on neuropsychological performance and functional outcome in schizophrenia. Interested in the use of neurocognitive data to enhance diagnostic validity, rehabilitation and the search for endophenotypes for the illness. Also has broader theoretical and historical interests in schizophrenia. website Brain, Behaviour and Cognitive Science Space perception, binocular vision, eye movement. Latent variable modeling, item response theory, measurement invariance, computational statistics. website Robust ANOVA methods, multiplicity control, equivalence testing, and the measurement of change. website Psychometric methods and longitudinal data analysis; substance use and abuse, developmental risk and resilience, and personality assessment. website Statistical graphics, multivariate statistical methods. e-mail The roles of trait perfectionism and perfectionistic self-presentation in personal adjustment, psychosocial functioning, and health problems. The associations among personality, coping, stress, and distress in adolescents, middle-aged individuals, and the elderly. website The development and application of quantitative methods for psychological research, particularly psychometric methods, and longitudinal data analysis. e-mail Social psychology, health-related fields. Work stress, burnout, coping, psychosocial factors and rehabilitation, and psychological effects of SARS in nurses. Coping, social support and health, especially interested in applying a new scale, “The Proactive Coping Inventory” to a variety of different populations. e-mail The automatic activation of associations related to social categories including stereotypes, prejudice, automatic behaviors, approach-avoidance tendencies, and emotions. The implication of these associations for responding to target category members and the self. Strategies to reduce these activations. e-mail Stress, adaptive coping, and health. e-mail Social psychology of intergroup relations with a focus on issues of ethnic, cultural, and national identity. Responses to discrimination, immigrant acculturation, and bicultural identification. e-mail Projection of the self into fictional narratives. The ascription of intentionality to abstract social agents. Individual differences in, and the core processes of, empathy and social understanding. Imagination. Stimulation based theories of language comprehension. And the neural underpinnings of these processes. e-mail Social information processing and social cognitive models. Aspects of the self, depression, and interpersonal communication. e-mail How psychologists conceptualize and research lesbian, gay, bisexual and transgender experience. Stereotypes of sexual assault and childhood sexual abuse survivors. e-mail Research focuses generally on behavioural assumptions in the law, and specifically on the behaviour of various decision makers (e.g., juries, police). Considerable work done on decision-making processes of decision makers in cases involving violence against women (sexual assault, battered women). More recent work examines the impact of racial bias and legal strategies for curbing its influence (e.g., challenge for cause). e-mail Stereotyping, prejudice, and discrimination from the target’s perspective. How people combat the effects of negative self-relevant stereotypes in academic settings. How stereotypes are activated and inhibited in impression formation. The development of gender/ racial stereotypes and beliefs in children, examined from a social cognitive perspective. e-mail Social cognition or how people make sense of themselves and other people. Social and organizational psychology, including attributions, social motivation, forgiveness, co-worker interactions, and decision making. e-mail Psychological aspects of driving; human needs and psychological dimensions of housing; scientific racism; violence and explanations of criminality. Ethics and societal values influencing research practice as well as strong interest in applied psychology. The core faculty of the Clinical Neuropsychology stream (CNS) are registered psychologists with specialty training in neuropsychology or pediatric neuropsychology. They are also members of the Clinical or the Clinical Developmental areas of Psychology. 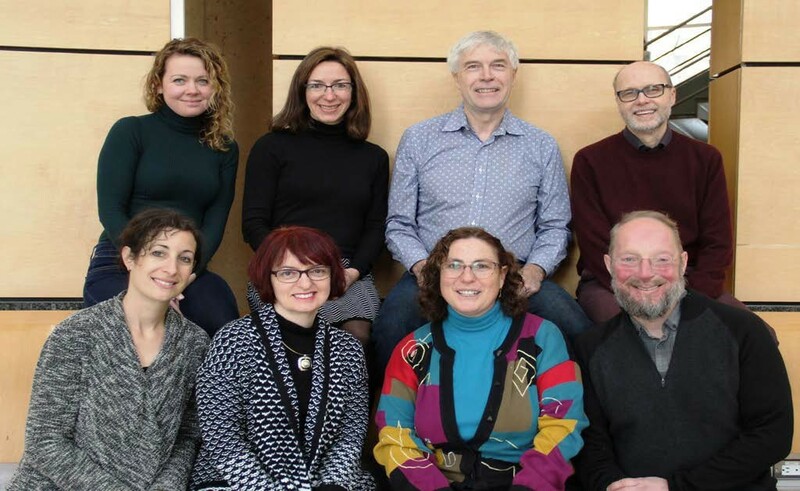 Pictured above; Top row left to right: Magdalena Wojtowicz, Christine Till, Norm Park, Walter Heinrichs. Second row left to right: Shayna Rosenbaum, Mary Desrocher, Jill Rich, Gary Turner. Neural correlates of higher cognitive (i.e. executive control) functions in normal aging, brain injury and disease. Neurorehabilitation interventions to enhance cognitive funtioning in normal aging and neurological populations. Integration of brain and behavioural measures in neuropsychological assessment. Assessment of cognitive capacity in real-world settings. The overall objective of my research program is to improve our understanding of cognitive dysfunction, psychological functioning, as well as mechanisms of compensation and recovery, in patients suffering from neurological disorders.